The fall semester hasn’t officially started yet, but that didn’t stop 13 of Augustana’s new international students from receiving a lesson in civics and leadership this afternoon. Their teacher: Sioux Falls Mayor Mike Huether. 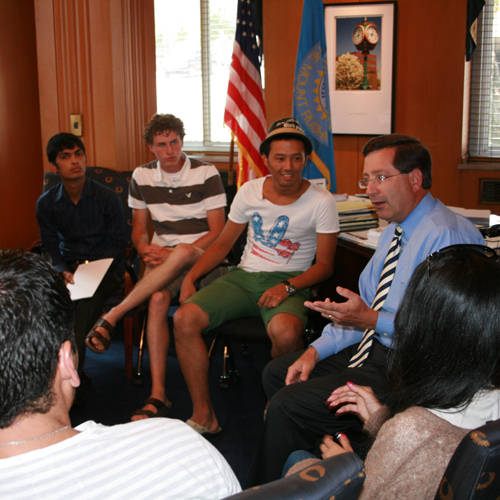 “Welcome to the United States, welcome to Sioux Falls,” Huether said as he shook hands with students from Russia, Moldova, Pakistan, Algeria, Oman, United Arab Emirates, Tajikistan, Kyrgyzstan, Armenia and Bangladesh. Each is a member of the Global Undergraduate Exchange Program (UGRAD), an initiative administered by IREX, World Learning and the American Councils on behalf of the U.S. State Department. “You couldn’t have picked a better school, in a better town, with better people. You’re going to love it. But, you’re gonna hate the winter. The winter’s tough,” Huether joked to the group. The mayor talked to the students about his upbringing, his professional career and his inaugural year in office. "Don't let anyone talk you out of pursuing your dream. Study for it. Pray for it. Work for it," he said. Since arriving in the U.S. earlier this month, the students have toured a number of local agencies including the POET Ethanol Facility in Chancellor, print and television news media outlets and the Sanford Hospital and Research facility. In addition to talking with the Mayor, the students also met with other Sioux Falls City officials today including, Darrin Smith, director of Community Development; Jim Sideras, fire chief; Mark Cotter, director of Public Works; Jeff Schmitt, assistant planning director; and Tracy Turbak, finance director. Earlier this summer, Augustana reported its largest-ever class of incoming international students. College officials anticipate more than 60 new students representing 30 countries and five continents to begin their studies at Augustana this fall for the 2011-12 academic year. The new students will join 40 continuing students, for an expected total of more than 100 international students – up nearly 32 percent from last year and more than double the number of international students on campus during the 2009-2010 academic year.